To create a new plan click the button from the bottom right corner of the screen. Default billing plan: When a new default billing plan is set it will apply for newly created clients. It does not change for existing clients. You must always have at least one pricing plan defined but fleio allows you to create additional ones. 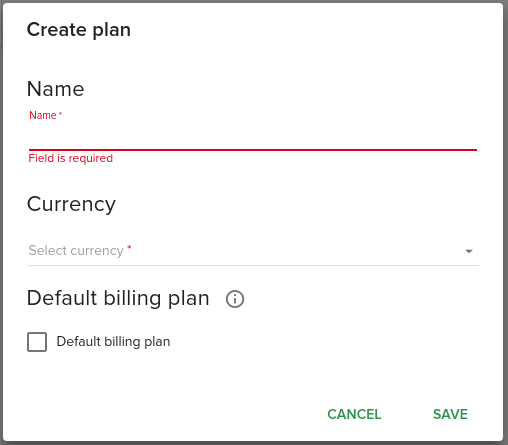 The default plan applies to all customers by default and you can define additional pricing plans for various customer categories. For instance, you can to define discounts and use a different currency for a subset of customers. The currency is selected per plan and applies for all pricing rules in that plan. Note that a client is always invoiced using his default currency. The exchange rate will be applied to the amount determined by the pricing rules (if the client’s currency is different then the plan’s currency). Right now you can create pricing rules for instances, volumes, images and L3 bandwidth, assuming L3 networking is used. Future Fleio releases will support any kind of OpenStack resources, like VPN or Swift objects. Click the Delete plan icon when hovering over a plan or enter its details page and hover over the action button. 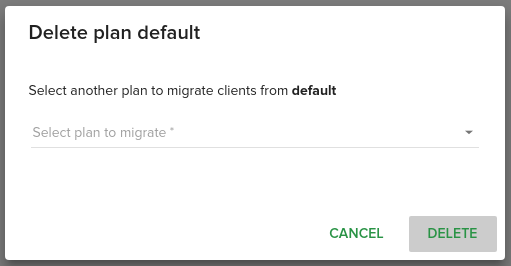 If you delete a plan, you’ll need to select another one to migrate the clients in the openstack plan you select. 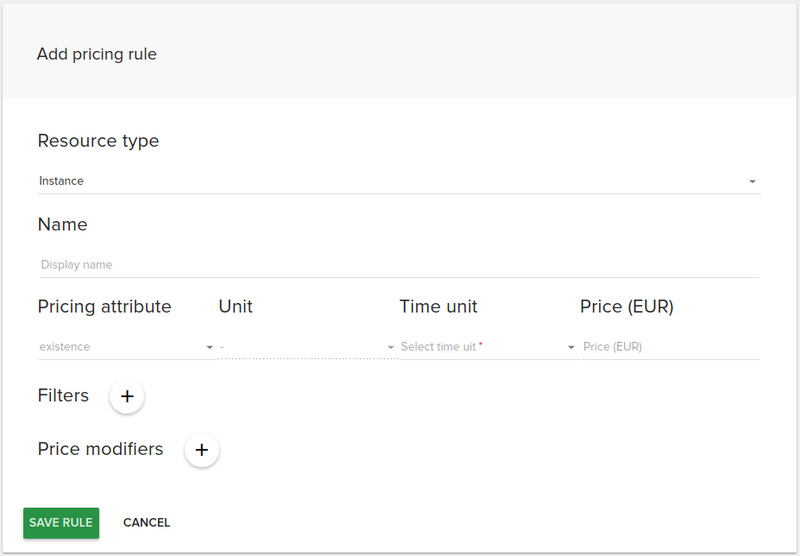 To create a new pricing rule, click the (+) button either from the openstack plan details page or the openstack plans page when hovering an item. You’ll get redirected a new page with the following form that will be explained below. One plan includes several pricing rules, each with it’s own set of filters and modifiers. The currency set for the billing plan is used for all pricing rules in that plan. multiple rules can apply to the same cloud resource and the price outcome of each rule will be added to the total price. The pricing rule name is only used for staff reference. The Pricing attribute is used to determine what to charge for. For example, in case of an Image, a Pricing Attribute set to size will calculate the price based on the Image size. If the Pricing Attribute would be set to existence, then the price of an image of any size would be set. The Unit can be set for specific attributes like memory_mb or any attribute that can be converted to a different size. If you want to charge an instance per GB of memory, you would set the Pricing attribute to memory_mb and the Unit to Gigabytes. Example: Charge $1 per 2GB of Instance RAM/Hour translates to Pricing attribute set to memory_mb, Unit set to Gigabytes, Time unit set to Hour and price set to 1, assuming the Plan currency is USD. of hour and the Pricing attribute set to existence means the price is set for every hour the instance exists in the cloud. The total cost for a resource may end up being negative, especially when negative modifiers are used for discounts. Fleio deals with these prices by setting them to zero. This can be controlled from the Fleio settings.py file by setting OSBILLING_NEGATIVE_PRICE_ALWAYS_ZERO to False if you want negative prices (increasing your client’s credit balance in time) or True, which is the default, to always set negative prices to zero. Pricing rules are by default applied to all resources of a type. To limit the scope of a pricing rule to a subset of resources, filters should be applied. Typical filters are: instance_type is m1.small or volume_type is SSD. For example, setting the filter instance_type is m1.small on an Instance pricing rule, will configure the pricing rule to only apply on instances with the m1.small flavor set. Multiple filters can be added. The logical AND is used between them. In other words: the pricing rule applies only if all the filters are true. Price modifiers define additional cost added or subtracted to/from the rule’s base price. For example, if you want to offer a discount of 10% for instances in a specific availability_zone you would create a modifier with the Attribute name set to availability_zone and the name of the availability zone desired, check the Price is percent checkbox and set the percent to -10 (as negative for discount). If you instead would like to charge a fixed amount of $10 for each instance running Windows, you would create a modifier with the os_type attribute set to windows and a fixed price of 10USD and the Time unit set to hour. existence: A price per Time Unit (second, minute, hour, billing cycle). vcpu: The price per Time Unit is multiplied with the number of virtual CPU cores. root_gb: The price per Time Unit is multiplied with the number of GB of the instance’s main disk. memory_mb: The price per Time Unit is multiplied with the number of MB of the instance’s memory. ephemeral_gb: The price per Time Unit is multiplied with the number of GB of the instance’s ephemeral disk size. existence: A price per Time Unit (second, minute, hour, billing cycle) regardless of the size in GB. size: The price per Time Unit is multiplied with the size of the image. You can select the Size Unit: Bytes, Kilobytes, Megabytes, Gigabytes, Terabytes, Petabytes. This rule applies to the number of GB that have passed through an L3 network. Flat pricing means that the number of GB is multiplied with the Price per GB that is filled in. Tiered pricing allows to set difference pricing depending on the volume of GB that is charged. For example you can define that the first 1 000 GB cost 0.05 EUR per GB, the following GB up to 10 000 GB cost 0.045 EUR per GB, and the next GB (from 10 000 GB to infinite) cost 0.04 EUR. You can also set the first tier to be free. I.e. the first 100 GB are included at no cost. NOTE How to configure OpenStack to support network bandwidth billing/accounting. The neutron-metering-agent needs to be installed besides each neutron-l3-agent in order to support L3 networking accounting. Assuming we have the Neutron L3 metering agent installed and the Ceilometer notification agent and Gnocchi and a Fleio pricing rule defined for bandwidth, the traffic accounting should start to display the cost for L3 networking in a few minutes. Under the network pricing rule we can also define pricing for the number of floating IPs a client is using during a month. The metric name is called ip.floating and the price is per IP-month multiplied by the average number of IPs during a month. This assumes that Ceilometer was setup to gather metrics correctly and send them to Gnocchi for further processing. storage.objects - the average number of objects in a month is computed and the price is per object-month. storage.objects.containers - the average number of object containers in a month is computed and the price is per container-month. storage.objects.size - the average size in Gigabytes of all objects is computed during a month and the price is set per GB-month. Notice the names of a few metrics: storage.objects.incoming.bytes, ..outgoing.bytes. Fleio will always rescale this values to Gigabytes. This assumes traffic data collecting was setup correctly in Fleio. See traffic monitoring for more details. Fleio has support for billing the following types of instance traffic. Pricing is specified in GB/billing cycle. Distinction between public and private traffic is done based on ip address at port level. If a port as at least one public ip address all traffic on that port is considered public traffic. If a port has only private ip addresses then all traffic on that port is considered private.